Cambridge University Press, 9780521722308, 383pp. This book documents how China's rural people remember the great famine of Maoist rule, which proved to be the worst famine in modern world history. 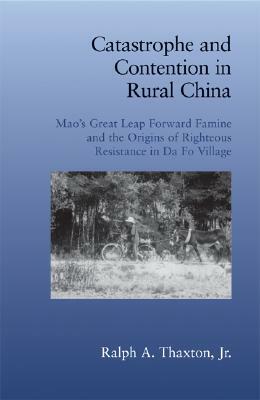 Ralph A. Thaxton, Jr., sheds new light on how China's socialist rulers drove rural dwellers to hunger and starvation, on how powerless villagers formed resistance to the corruption and coercion of collectivization, and on how their hidden and contentious acts, both individual and concerted, allowed them to survive and escape the predatory grip of leaders and networks in the thrall of Mao's authoritarian plan for a full-throttle realization of communism - a plan that engendered an unprecedented disaster for rural families. Based on his study of a rural village's memories of the famine, Thaxton argues that these memories persisted long after the events of the famine and shaped rural resistance to the socialist state, both before and after the post-Mao era of reform.